Safety mats are pressure-sensitive machine safeguarding products for the industrial marketplace. 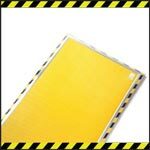 Safety mats are designed to detect the presence of workers or passer-by on the mat surface area around hazardous machines. These mats are flexible, impact resilient, functional after punctures, extremely durable and will not rust. We offer the largest selection of sizes and styles available. 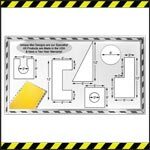 Custom safety mats and large machine layouts are our specialty. We are the manufacturer and the safety mats are Made in USA. 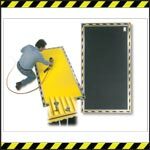 Heavy duty and flexible safety mat system. The Category 3 controller meets all safety standards. This style system is the traditional style of a normally open (NO) switch mats. Customized shapes and sizes of mats is our specialty with large 6′ x 12′ single mat capability. Made in USA. Heavy duty and flexible safety mat system. The Category 4 STTS Controller actually pulses each individual mat every 19Ms to assure no tampering to the mat or controller was attempted. Simply the most durable safety mat system in the world. Customized shapes and sizes of mats is our specialty with large 6′ x 12′ single mat capability. Made in USA. High-temp non-skid safety mat for use in harsh environments such as robotic welding and hot forging applications. The mats can have irregular cuts, contours, notches or wiring locations to accommodate specific welding cell layouts. The maximum size of one mat is 72” wide x 144” long and can be made into any configuration. Multiple mats can be connected to create a safe zone. Made in USA.